The Allegheny Mountain Region of the Antique Automobile Club of America (AACA) was founded on February 2, 1951 by William E. Swigart, Jr. It is a non-profit organization whose purpose is to encourage members to acquire, restore, preserve, and exhibit antique automobiles. The Allegheny Mountain Region is located in Central Pennsylvania and is currently under the leadership of President Bill Forsht. The Region has over 200 members residing throughout Pennsylvania, Tennessee, and New York. The Region members enjoy local weekend tours as well as join national events, such as 2005 AACA Glidden Tour Host; 2011 to Cass railway, West Virginia; 2012 & 2016 Founder's Tour host. Membership in the Allegheny Mountain Region is open to anyone who enjoys antique automobiles. Dues are $10 (reduced for 2018!) for single or joint membership. A membership entitles you to receive the Regions news publication Vapor Locks, which is published bi-monthly. Vapor Locks keeps members up-to-date on all Region events and includes interesting stories of Yester-Year and an automotive classified section for antique cars and parts. 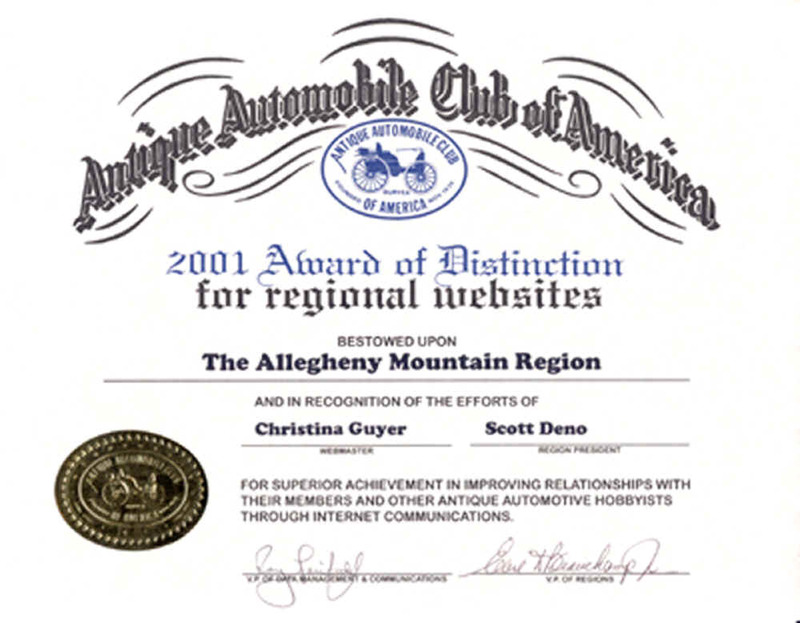 Membership in the Antique Automobile Club of America is required to obtain membership to the Allegheny Mountain Region. The Antique Automobile Club of America, founded in 1935, is the world's largest automotive historical society. The AACA is dedicated to perpetuating the memories of early automobiles by encouraging their history, collection, and use. Of all the old car clubs, AACA is probably the most international in character and organization with over 60,000 members and 400 regional clubs worldwide. Membership in AACA includes a subscription to the Antique Automobile magazine, which has been published bi-monthly since 1935. The AACA also publishes Wheels, the official publication for junior members. National membership is $35.